Medical alert pocket - has a MEDICAL SYMBOL silk screened in red just below the lower outside. Easily take your medical information, your daily medical supplies and medications with you. 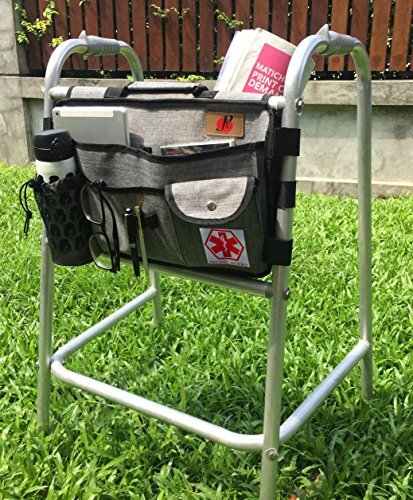 Work perfect for Folding Walker and Rollator Walker. MEASUREMENT: 17"W x 10.5"H x 2.25"D - Side velcro strap 6.55"
➽ MULTI FUNCTIONAL: "Padded Organizer Pouch" to protection some of your more delicate items. | "The bottle/cup holder pocket" - having the water bottle on hand is very helpful. | "Carabiner Keychain Clip" - keep your keys organized and within reach - MEASUREMENT: 17"W x 10.5"H x 2.25"D - Side velcro strap 6.55"
If you have any questions about this product by P&F HIGH QUALITY PRODUCTS, contact us by completing and submitting the form below. If you are looking for a specif part number, please include it with your message.